We’d love your help. Let us know what’s wrong with this preview of Scripture Scribbles by Phillip Dillman. To ask other readers questions about Scripture Scribbles, please sign up. 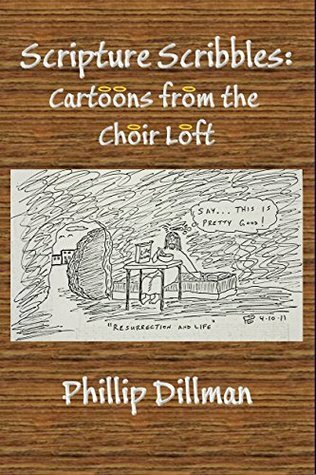 Dillman's dry humor and his faith come through as one goes from cartoon to cartoon. His pastor and congregation obviously love both him and his work. There are religions in the world that openly state that fun is not a part of their ideology. Christianity, I think is quite different. Jesus was a man who people enjoyed hearing and being with. I can imagine that he smiled and laughed a lot. Evidence of this is in the second chapter of John's Gospel. Jesus and his mother were attending a wedding at C Dillman's dry humor and his faith come through as one goes from cartoon to cartoon. His pastor and congregation obviously love both him and his work. Jesus was a man who people enjoyed hearing and being with. I can imagine that he smiled and laughed a lot. Evidence of this is in the second chapter of John's Gospel. Jesus and his mother were attending a wedding at Cana. Yes, this is the miracle of water transformed to wine. People who are difficult and sour are not the kind of folks who are invited to weddings. Dillman has, in his book, given us reasons to smile and think about what we read and hear in Christian churches. One often grins and then, before going to the next cartoon, realizes a deeper meaning. Scripture Scribbles often changes the nature of our smiles from fun to peace. Get the book and read it—not once but, frequently. Phillip Dillman had given us a unique insight through his gift. Five happy stars!